The online clothing market is worth billions each year with more and more people entering this area of eCommerce selling their own fashions and accessories. The most important thing with a fashion store is presenting your items for sale in a nice clear way, good product photography is an absolute must. Your store should also reflect your style and brand, your chosen design should be fast loading and attractive to look at so you can present your photography of your items to potential buyers. 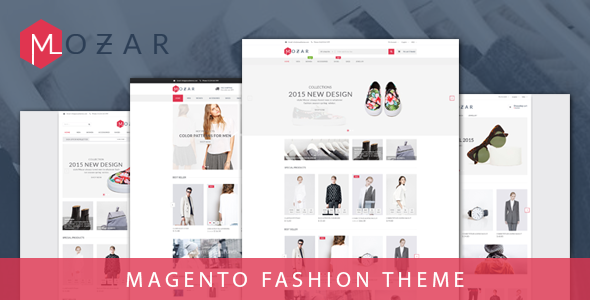 With that in mind, we have gathered together these below 5+ Elegant Magento Fashionable Clothing & Store Themes. 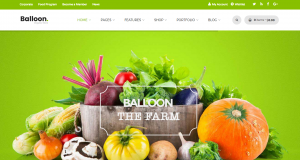 The Glory is a Multipurpose Supermarket Magento Themes. 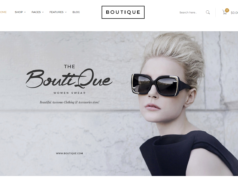 This theme is premium and responsive template, with 15+ unique fashion designs. It has an advanced powerful admin option with extremely customizable, easy to use and fully mobile compliance. Suitable for every type of store. Great as a starting point for your custom products. 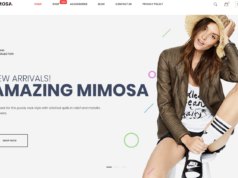 Mozar is a Magento Clothing theme designed especially for fashion stores, clothing stores, accessories store. It is an online eCommerce Store that has some powerful features which will help the user to advertise, manage and promote their sales higher. 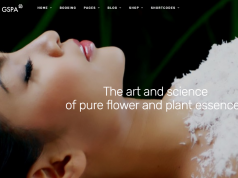 This design has 4 homepage layouts integrated simple Magento extensions bring the elegance and graciousness. It has a big slideshow with large images, nice font, eye-catching effects on Mega Menu is a highlight of this Magento theme. The blog is a useful extension. Customers and shopkeepers connect with each other by writing posts, comments, reviews, feedbacks and so on. Related products, upsell products in detail are placed in the column or in a slider. Theme Options help you change a font, a color of titles, show New or Sale labels easily in admin. Ves is beautiful responsive Magento Clothing theme with a modern & elegant design. White background color combines with neat, clean & well-organized layout make your items more outstanding. This theme is specifically designed for clothing, fashion store, Smartphone shop, headphone store, tool and machine store. Besides, live theme editor helps you to customize the front end without touching any code line. Also, if you concern about the installation process, our quickstart package is included that allows you to install extremely fast. 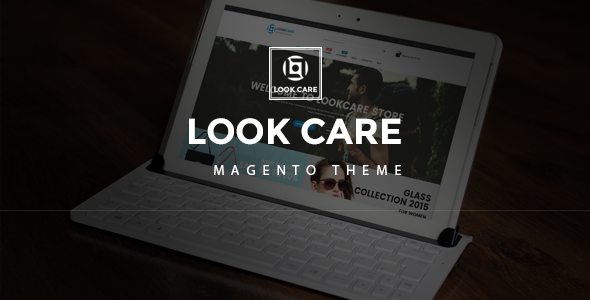 LookCare is the most modern Fashion Responsive Clothing & Store Magento Theme that is perfect for all clothing, shoes, accessories for men. It is mainly designed in blue, white and black, which definitely will attract your eyes. Magento is a highly popular eCommerce platform that gives users a complete flexibility and control over their online store. 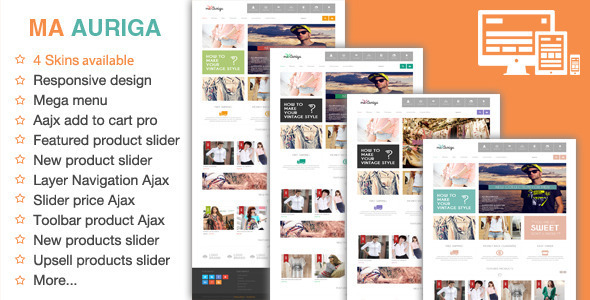 Auriga is a Responsive Accessories, Clothing Magento Theme with powerful Theme Framework for the fashion world, such as clothes, hats, caps, accessories and many others fashion types. It comforts customers and helps them navigate from anywhere in the store. Visually, a slideshow with large size image and impressive transitions will make you surprise for its boost sales efficiency. Many other functions are just around the corner to help you develop your outlet to be more and more popular. With four available colors : red, blue, green, pink; probably, your website will be congruent with your store image. This theme integrated many extensions such as new products slider, featured products slider, brand slider, ajax cart super, upsell slider, related slider. These extensions make this theme more flexible. New products slider, featured products slider bring slideshow of new products, featured products. Brand slider module brings slideshow of an image of brands.